I first heard about the Starlight Trilogy through word of mouth. Many of my trusted online friends had been talking up the story on twitter before the release of the first book in 2013, so I downloaded the book onto my kindle as soon as it was available. After a very hectic time, I gladly welcomed a long holiday weekend. I decided to spend some of my time off by enjoying a bit of leisure reading. I began Starlight early one morning, figuring I’d read a few chapters before moving on with my day. Well, as it turns out, I rarely moved from my favorite reading perch for hours. Once I was drawn in by the Prologue, there was no going back. Over the course of the afternoon, I found it nearly impossible to put my kindle down, and by the evening I had finished the story. I spent the next year eagerly awaiting the release of the second book, Starbright, and my expectations for a worthy sequel were quickly met. In writing this series, Alexandra Richland has demonstrated great skill as a storyteller. The romance between Aidan and Beth builds slowly during the course of the first book, but their love story is genuine and profound. Starbright builds upon the fragile foundation of this couple’s relationship as the two young lovers develop their physical intimacy. Aidan’s tenacity vanished. He turned around. The look in Beth’s eyes showed she wanted him here as much as he didn’t want to leave. He approached her slowly and discovered she was no longer shaking. He touched a tender hand to her cheek. She was no longer cold. Aidan bathed in her vanilla scent, which was extra potent from the rain. Her lips were just an impulse away, but he wasn’t about to be reckless with her. Not with Beth. Not his fragile little dove. “You’re so beautiful.” The compliment slipped from his lips in a reverent whisper. Aidan dipped his head and swept his arms around her waist. Beth closed her eyes in silent offering. Ever so slowly, he brought their lips together, his hands traveling down her side to her hips. Beyond the tantalizing attraction these two feel toward one another, Starbright offers much more to the reader. The backdrop of the movie studio is incredible in its detail and is filled with fascinating secondary characters, some of whom are completely fictional and some of whom are amongst the biggest stars in the history of cinema. Chief among these characters is Starlight Studios head, Luther Mertz, who views any connection between the rebellious Aidan and the demure Beth as a detriment to his carefully managed empire. “…he withdrew a magazine from the top drawer of his desk and slid it toward her. The publication was opened to a specific article, which he positioned so she could look at it right-side up. The blood drained from Beth’s face. She gripped the armrests and rose from her chair, peering over the desk at the publication. It was an issue of Life magazine. The largest photograph was the group shot of her, Aidan, and their friends taken after the race. The other photographs were of Aidan and his Porsche. Surely the group photograph wasn’t the source of her boss’s anger? It is clear that the author has a deep respect and knowledge for 1950’s Hollywood. As such, a reader can be swept up into the fantastic life of movie-making while still feeling that the novel offers a realistic portrayal of both the era and the larger-than-life circumstances that took place in the entertainment capital of the world. The cast of secondary characters are rich in both complexity and amusement, and the bustling activity of life behind the gates of Starlight Studios is glamorous and enthralling. 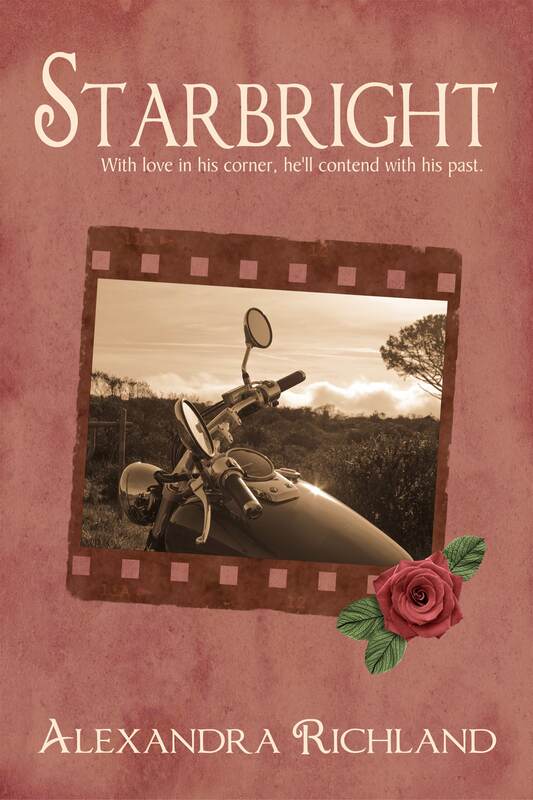 If you are looking for a carefully crafted and well-written love story, I highly recommend reading Starlight and Starbright. The conclusion of this trilogy, Stardust, is expected to release during 2015, and I know I’ll be one of the first in line to buy a copy. You can purchase all of Alexandra Richland’s books on her Amazon Page and you can also follow her on twitter: @RebelMissAlex. This entry was posted in Alexandra Richland, Books, Books For Review, Reviews and tagged Alexandra Richland, Books, Books for Review, reviews, Starbright, Starlight trilogy.